Cylinder Stoves are built tough. 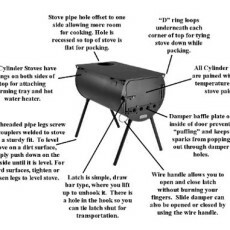 This stove can handle all the rough treatment and rugged conditions of packing in. Whether you reach camp by pickup or by packhorse, you can depend on your Cylinder Stove to do the job right when you get there. Here are a list of Cylinder Stove Accessories .